Pancam false-color view acquired on sol 3066 of fine-scale layering in the Whitewater Lake locality. Veneers have been resistant to wind erosion and enhanced the layered appearance of the outcrop. Layers are typically several millimeters thick. Mars may have been capable of supporting microbial life for hundreds of millions of years in the ancient past, new findings from a long-lived Red Planet rover suggest. NASA's Opportunity rover, which celebrates 10 years of Mars exploration on Friday (Jan. 24), has uncovered evidence that benign, nearly neutral-pH water flowed on the Red Planet around 4 billion years ago. "These [benign] water conditions existed over a long period of time," said Ray Arvidson, lead author of the new study and Opportunity deputy principal investigator. Therefore, primitive organisms may have been able to survive on Marsfor long stretches during a period when life was getting a foothold on Earth, said Arvidson, director of the Earth and Planetary Remote Sensing Laboratory at Washington University in St. Louis. "That wouldn't be a surprise," he told SPACE.com. "Maybe not globally; [habitable environments] could have occurred here and there regionally. And it may not have been for the whole time continuously. We don't know." Pancam false-color image acquired on sol 3208 of Matijevic formation rocks at the Whitewater Lake locality, showing embedded spherules. Approximate scale across image is 40 cm. The golf-cart-size Opportunity touched down on Jan. 24, 2004, three weeks after its twin, Spirit. Both robots were tasked with 90-day missions to seek out signs of past water activity on Mars. Spirit was declared dead in 2011, but Opportunity is still going strong. The rover made the new discovery at an outcrop on the rim of Endeavour Crater, a 14-mile-wide (22 kilometers) hole in the ground that Opportunity reached in August 2011. NASA's Mars Reconnaissance Orbiter spotted evidence of exposed, aluminum-rich clay minerals at a site along the rim called Matijevic Hill. Such clays generally form in the presence of benign, mildly acidic water, so the rover team commanded Opportunity to go check out the rock formation. 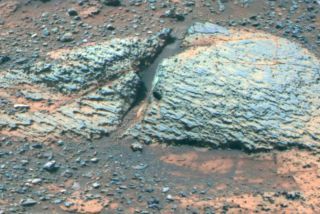 These clay-enriched rocks are studded with BB-size "spherules" and cut by numerous fractures, through which liquid water flowed long ago, Arvidson said. "The groundwaters that moved through those fractures were only mildly acidic, and mildly oxidizing to reducing," he said. "So, the earlier you go, the more clement the conditions were." These ancient rocks predate the asteroid or comet impact that created Endeavour Crater, and they're covered in most places by younger material that bears the signature of hypersalty and much more acidic water — the signature, in other words, of a much less hospitable Mars. MI mosaic acquired on sol 3064 showing a dense concentration of spherules at the Kirkwood target and locality. Approximate scale across the scene is 5 cm, and illumination is from the top. Opportunity's new results take on deeper meaning when combined with the observations of the 1-ton Curiosity rover, which touched down on a different part of Mars in August 2012. Curiosity was designed to extend and advance the discoveries of Spirit and Opportunity. It sports 10 different science instruments — a suite crafted specifically to determine if the Red Planet could ever have supported microbial life. Last month, the Curiosity team announced that an area near the rover's landing site harbored a large, shallow and potentially habitable lake system during Mars' Hesperian era, which follows the Noachian in Red Planet chronology. This lake and its feeder streams likely existed about 3.7 billion years ago, or perhaps even a bit more recently, mission scientists said. So researchers are starting to get a better idea of the Martian surface's window of habitability, Arvidson said. It appears that window might have been open — off and on, perhaps, and here and there — for hundreds of millions of years in the distant past. Liquid water cannot exist for long periods on the surface of present-day Mars, whose atmosphere is just 1 percent as thick as that of Earth. That atmosphere was likely thicker long ago, if lakes and river systems were, indeed, stable for lengthy stretches, Arvidson said. "One way to do it is to have massive impacts, and to have a [temporarily thicker] atmosphere," he said. "So it could be that you have multiple impacts over that extended period of time, and collectively they made for a sustained presence of water on the surface and in the shallow subsurface. But we don't know, at this point, with just two examples."